The following procedure is for the LH side. The rear speed sensor is a component of the rear axle hub and bearing assembly. 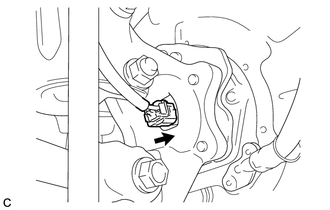 If the sensor malfunctions, replace the rear axle hub and bearing assembly. If the sensor rotor needs to be replaced, replace it together with the rear axle hub and bearing assembly. (a) Install the rear axle hub and bearing assembly (See page ). (a) Connect the connector to the rear speed sensor.